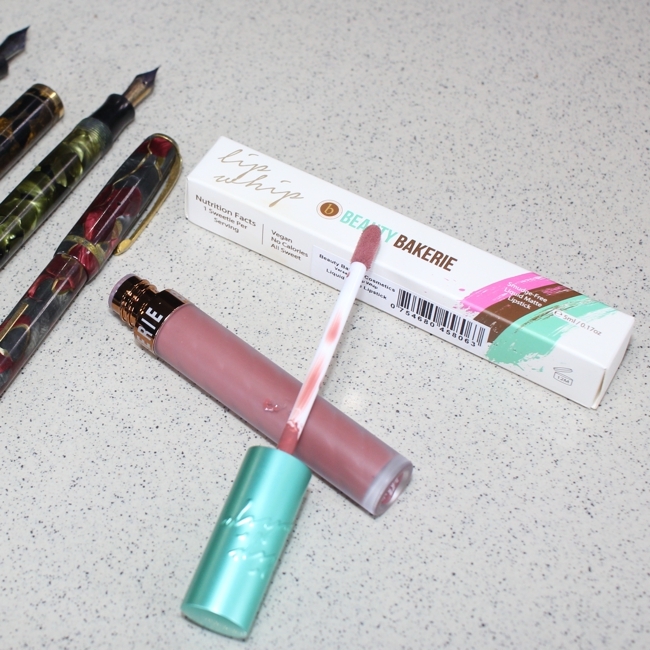 This year, I've discovered some of the most amazing liquid lipsticks out there. Lightweight, easy to glide on formulae that stay on without the uncomfortable rip-your-lip dryness. Beauty Bakerie's Lip Whips are one such discovery. 100% vegan and cruelty-free, the brand has been making waves on Instagram with the Lip Whips and the beautiful Neopolitan EyesCream palette (NEED! It's even prettier than Too Faced Sweet Peach). The Lip Whips come in 28 matte shades. You also get Metallic Lip Whips. Needless to say, I picked the subtlest, dusty-pink matte. Scroll down for the review and swatches of Beauty Bakerie Lip Whip in Versailles. 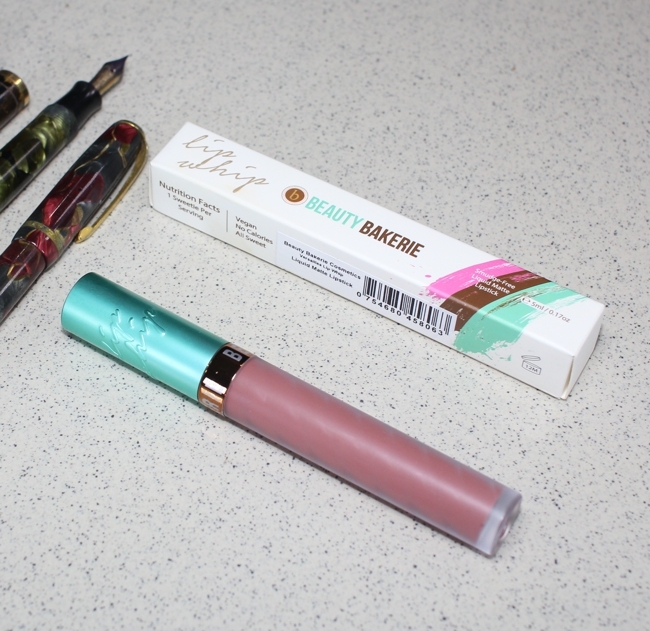 The packaging of Beauty Bakerie Lip Whips is functional; the discerning feature is the metallic aqua green lip atop the plastic tube. The doe-foot applicator picks up enough product for one use. The texture is where the Lip Whips stand apart from other matte "liquid" lipsticks. This one is a mousse. Think well-whipped, fluffy egg whites that stand up in peaks. Not runny at all, but soft, light and creamy. The Lip Whip gives full coverage. Because the product is lightweight, I have to go through my lips a couple of times with the applicator to prevent patchiness, but no biggie. Drying time is shorter than Huda Beauty and Jouer Lip Cremes, but longer than MUFE Aqua Rouge and Rimmel Provocalips. When it dries, the Lip Whip dries matte. Your lips need to be exfoliated and well-moisturised to prevent the Lip Whip from emphasising dry areas or flakes. Once dry, the Lip Whip will not budge. I've had it last through pasta and pizza without problems. There is no transfer. Removal needs a proper cleansing balm or oil cleanser, or a two-phase makeup remover. Micellar water doesn't remove the Lip Whip completely. Beauty Bakerie themselves have a remover to get the Lip Whips off, though I haven't tried it. Huda Beauty Lip Mattes are runnier and less drying, and a tad more lightweight. 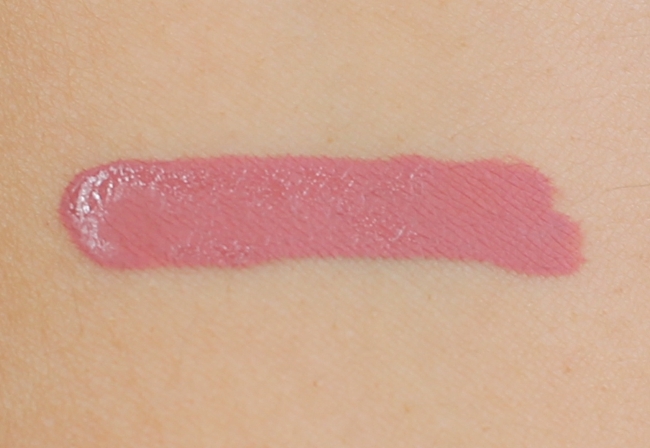 Here's the swatch of Beauty Bakerie Lip Whip in Versailles. One swipe, natural light - immediately after swatching, so you can see it has not dried completely. This swatch lasted through a shower and I had to scrub it off with Tata Harper's Nourishing Oil Cleanser. Versailles is mauve-ier on lighter skintones. On me, it is a wearable, subtle dusty-pink with brown undertones that is ideal for everyday use. If you are looking for a long-wearing lightweight mousse-like matte lipstick with good coverage, Beauty Bakerie Lip Whips are a great choice at the price. There is some dryness, yes, but not the my-lips-are-dead dryness. I'm a huge fan of the wear-time, which negates the need to retouch at work. I also love the whipped, mousse texture and the wide shade options. Beauty Bakerie Lip Whips cost $20 or £16 each, for 5ml. They ship worldwide from here.